Rhizome | Robotica II. What Robots Get up to after Dark. Mating robots ritual. This is the second in my series of worked with these robots. 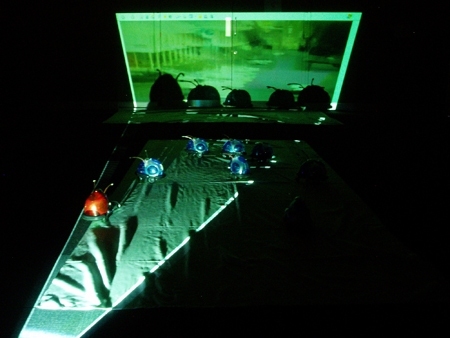 It is a prototype development experimental installation using robots to make sound composition. They react to each others movement using (Motes) wireless sensors which are added to the electronics of th ten robots these robots. As theyinteract it makes a generative sound composition of the environment they aree in. This prototype was made at the The Watershed Media Centre in Bristol in 2005 . The sound compostion represents proximity of the robots to one another. The Robots Can do many things: What robots get up to when the lights go out. Musical robot symphonic. Conducting a mating ritual behind closed doors with peep hole view. Robots wandering around in search of a mate. Interactive artwork with robots wandering around the gallery. This is the second in the series called Robotica, this experimental installation involves the robots to make sound composition. They react to each others movement using wireless sensors which are added to the electronics of the ten robots. As they interact it makes a generative sound composition of the environment they are in. This prototype was made at the The Watershed Media Centre in Bristol in 2005 . The sound composition represents attraction of the robots to one another. Robots have common behaviours, ie robots can follow a path (path following mode), the can avoid obstacles (avoidance mode), and they can operate in wander mode. In this playful installation they are trying to find a mate. Depending on their proximity to one another they produce aggressive sounds to warn one another off and to communicate.